At Sea Brite Dental we love when patients share with us their feedback and comments after chiropractic care. Please read our patient testimonials below to see what other people have achieved through their tailored treatment plans with us. We love reviews! We encourage you to leave a review on Google, Facebook or Yelp to let your neighbors, friends and family know about the care you received at Sea Brite Dental. I love my ultrasonic teeth cleaning experience. And Dr. Morris’s positive attitude. Extremely competent staff. Great dental assistant. Dr. Morris shared clear, concise explanations about things that other doctors didn’t make clear to me. She is no-nonsense and direct. 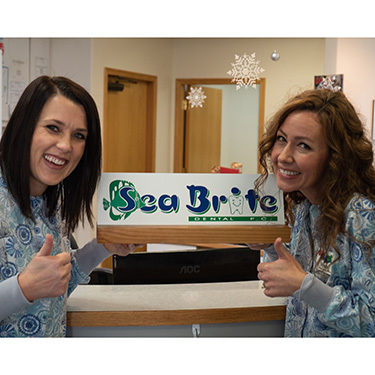 I can say that I had a really great first experience at SeaBrite Dental. I received great customer service, along with great recommendations and explanations for every part of my dental visit, including my billing. Staff were very genuine and friendly. Everyone is very nice. Everything was explained very well. Clean and professional. I felt relaxed and safe. I’m very happy with my experience here. I found you through combination of driving by, friend’s recommendation, and internet through insurance. First impression was of professionalism, and personality of dentist and staff. Glad to have found you! It’s hard to go to a nice dentist. After I left, I felt total confident and comfortable about coming here. Thanks for the good experience. Everybody there was very polite and professional and made me feel very comfortable. Also, very friendly and helpful. You saved some of my teeth when another dentist just wanted to pull them all. He did not really listen to my wish, you did. Thanks so much. Would Recommend Them To Everyone.. The staff and doctor was very helpful and explained the procedures that needed to be done. I am glad I chose Sea Brite Dental. Very nice staff. Up front personnel were welcoming. Sam and Dr. Morris were both nice and up front about my dental needs. Being a new patient, the hygienist and Dr. Morris were thorough in the examination/cleaning process. They also took their time in explaining the health of my teeth and answered my questions. I appreciate that very much. Keep up the great service and thanks! Brought the granddaughters in when was checking on Andy and Katie did a great job making them want to come back when they need a new dentist. Good care and kindness. Thanks.